I'm actually blurred when it comes to Home Insurance things. I have two houses of my own. One is situated in a village or subdivision type area where the family currently resides and the other one is located on a residential area and is being rented out. But, I never really thought of getting "home insurance" for my two houses. Maybe because, my reason is the same with most house owners... the money being spent on the policy could be better spent on more important things. Of course, we will never realize the importance of having one until we experienced a major disaster and our house was completely destroyed. The policy that we need actually depends on the country or state we live in. Philippines, being a disaster prone country might be a good consideration for getting a "home insurance". Some lending or financing institutions require a borrower to get a policy to make sure that their collateral is protected. One of the leader in the Philippines in this field is Malayan Insurance. There is also Philam Home Advantage Insurance Package. Both offered reasonable home insurance packages. If your homes are situated in the calamity prone areas, I think it would be wise to get a home insurance. But it still depends on the individual's needs and preferences and the amount of yearly premium that you have to pay. I think the normal premium ranges from P640 to P2,000 per annum depending on the kind of policy and it's inclusions. 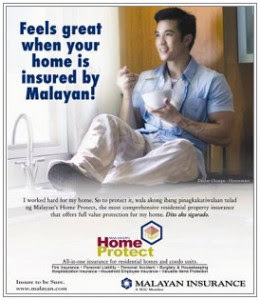 The "Home Protect Plus" from Malayan Insurance has upgraded it's coverage to include typhoon and flood assistance, forcible entry and theft and more as part of the comprehensive insurance package. There are so many options out there, one can also choose to insure with GSIS Home Insurance and that is if you are an active GSIS member. The premium is P640 for every P1 Million of annual coverage against fire. Other protection against earthquake, typhoon or flood can also be availed for an additional rate of only 0.04%. Whatever you choose, it is best to study the options, the policy inclusions, the premium, and most of all the the Insurance Company that you have to deal with. You have to choose a company that you trust and has a good reputation. Only then you can decide if it's already the right time for you to insured your valued properties.